Penticton, BC, Canada: Skookum Productions, Limited, 1995. First Edition . Paperback. Fine/No Jacket. 4to - over 9¾" - 12" tall. ILLUSTRATED, Fine white pictorial stapled card covers. (1995), 4to, 96pp. "On British Columbia's inland lakes and rivers the vessel of choice was the steam powered, paddle wheel driven, 'Sternwheeler'. 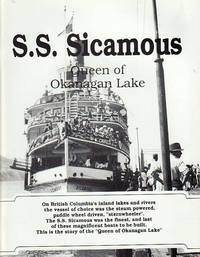 The S. S. Sicamous was the finest, and last of these magnificent boats to be built. This is the story of the "Queen of the Okanagan Lake" and the wharves of call on her daily tour of Okanagan Lake."